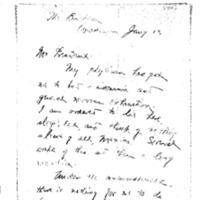 William Bayard Hale writes to Woodrow Wilson about his health and Mexico. My physician has put me to bed insomnia and general nervous exhaustion. I am ordered to lie here, sleep, eat, and think of nothing least of all, Mexico. Several weeks of this, and then a long vacation. Under the circumstances, there is nothing for me to do but to ask you to relieve me of further duty. I have done little or nothing, and there can be nothing I could do now, I think, though I would so gladly have had a part in helping at the settlement of a troublesome problem. As soon as the doctor will let me, I will look over my accounts, and seal them to Mr. Forster, together with three or four hundred dollars I must return. Hale, William Bayard, 1869-1924, “William B. Hale to Woodrow Wilson,” 1914 January 13, WWP18280, First Year Wilson Papers, Woodrow Wilson Presidential Library & Museum, Staunton, Virginia.